Gallery 2005-8 - The Joyous Quilter - Quilts and Patterns For Sale, Commissioned Quilts, Quilt Gallery, Quilting Tips & Tricks, Quilting Green and more! 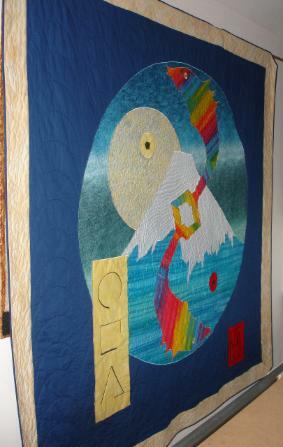 Here is the first of the four page picture gallery to show my journey of completed quilts for you to browse and enjoy. Some are commissions, some became treasured gifts to friends and family and a few remain in my possession. This was the first fully complete quilt I ever made with beautiful Asian fabrics, including wonderful dragons on the backing fabric. I gave it to my hubby for his birthday and it now looks great draped over a chair in our bedroom. 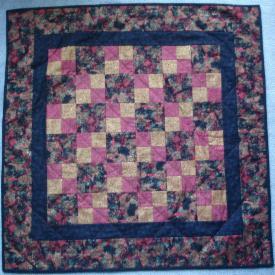 This was the second quilt I completed. Having already used the pattern with 'Dragon's Fancy' it was quick and simple to do another in a weekend. I gave this to a neighbor for a birthday present. I liked the fabrics so much I bought more of them and made another quilt called "This & That". Here is the matching cushion to 'Dragon’s Fancy', which I made a couple of months later with the leftover fabric. This baby quilt was made to celebrate the birth of twins - boy & girl - of good friends of ours. The other one is 'Star Twirls'. These were such fun fabric prints to work with and I used the outline of the printed patterns to quilt it which was really effective. 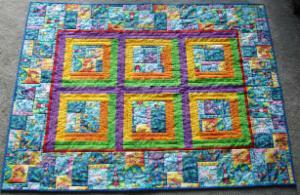 This is the other baby twin quilt to 'Bright Day'. These 'friendship' stars went together really fast and looked great. 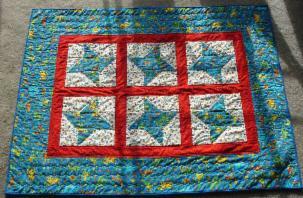 Simple echo quilting empahsised the stars. FunDay is an annual event planned by our local Quilt Guild where around 70 ladies gather in one large room and spend the day sewing, eating and laughing a lot. The project is kept secret until the day of the event, so this quilt pattern and the fabric were chosen by the FunDay Committee; lucky for me they chose Asian and Batik fabrics which are my two favorite kinds of fabric, so I love this quilt! I decided to learn how to hand quilt and stencilled leaves into the lighter colored sections, but after 5 years (!) I decided that I will finish the design by machine. I bought this wonderful rocking chair years ago, however on cold days the wood is a little chilly to sit on initially. I decided to make quilted covers for the seat and back which would not change the chair dimensions, but would avoid the chilly feeling. 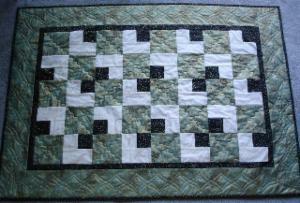 I made two specially shaped quilts each with a Celtic knot as a feature. I was very pleased with the result! This was a very simple pattern, but the fabrics made it interesting. 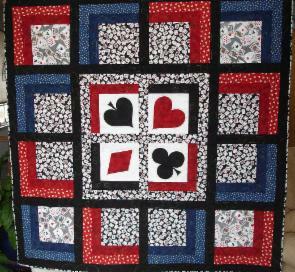 The border was quilted using a stencil pattern which was my first attempt at using them, but worked out well, even the corners. 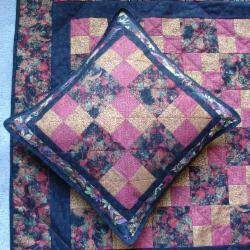 The centre was quilted simply, but using a fancy wiggly stitch on my sewing machine. 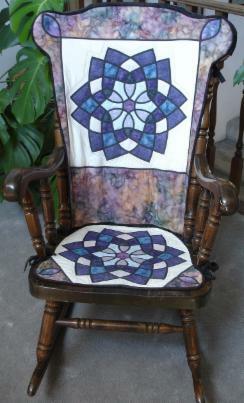 A local Quilt Shop owner saw me making the aforementioned rocking chair covers and suggested I run a class. This was the sample used to advertise the class and is now hanging on my sewing room wall. 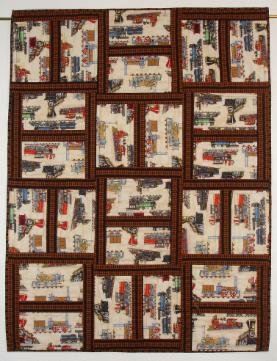 I found this great steam train fabric and then the neat little train tracks to accompany it. I pieced it simply so that the fabric was shown off rather than chopped up beyond recognition. On the back was another great fabric with little suitcases! This quilt is For Sale! Click here for more details. I wanted to practice free motion quilting and I had some funky cat fabric around which I stitched in a random pattern as I figured my cat Twiggy wouldn't care what it looked like!! 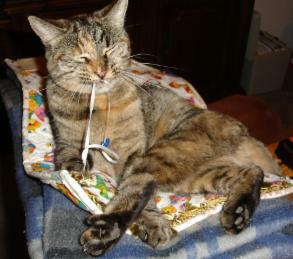 It was a wonderful practice peice and I added a few fun and entertaining embellishments, including a catnip bag and, as you can see, she loved it! 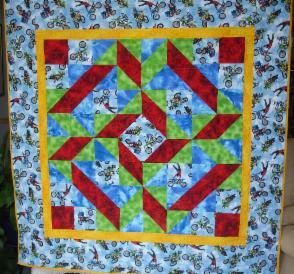 Here's a fun and simple quilt made out of soft and cozy flannels to celebrate the birth of a friends first baby. I bought the book with this pattern because I thought the patterns were gorgeous, however, the instructions in the book were really confusing. Luckily the author, Norah McMeeking, came to our Quilt Guild and presented a workshop which made it all make sense and here's the result...more out of this book to follow one day! 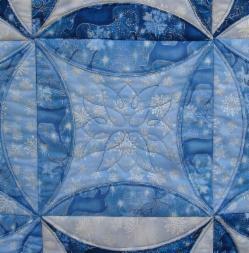 The whole quilt is paper pieced which allows wonderful accuracy and very sharp points. I fell in love with the paper piecing technique as a result. 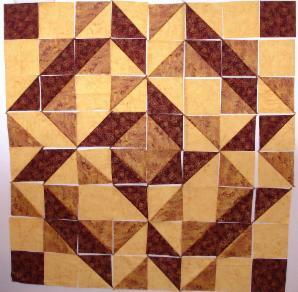 More of the square in square blocks (shown here in the border) were made as a feature panel right across the back. 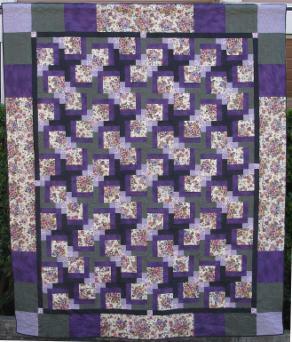 I found the pattern for this one in Quilter magazine and thought it would look great with the fabrics that I used in “Pansy Pathway” plus a couple of additional fabrics. I made this one to fit our Queen sized guest bed but had to get creative with the borders when I didn't have enough of the pansy fabric for a complete border. The back (see picture to the right) was also pieced using leftovers and a new piece of matching fabric that was found by chance, almost making it a double sided quilt. Once the top was completed I realized it was rather too large to quilt using my regular sewing machine, so it was lovingly tucked away and temporarily forgotten. 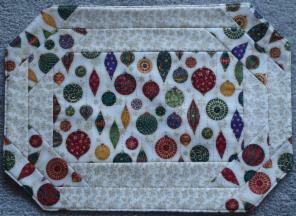 However, my wonderful husband bought me a mid-arm quilting machine this year in order to get this one quilted. 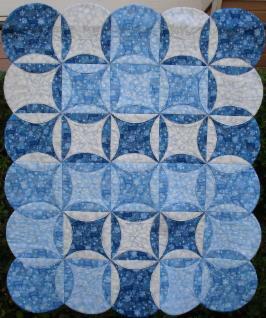 However, as it turned out, this was the 6th quilt to be quilted on the mid-arm by the time I got around to it! It was a miracle this quilt got made! I had all the pieces laid out on the guest bed and then we had overnight guests so it all had to be picked up....then (when it was all laid out again) the cats decided it would be a fun playground!! Finally a windy day with all the doors open blew half of the pieces onto the floor!! After hours and hours of figuring out which pieces belonged where, I finally sewed it all together. I was trying to achieve a gradual blending from light to dark through blues and lilacs and, my favorite, purple. 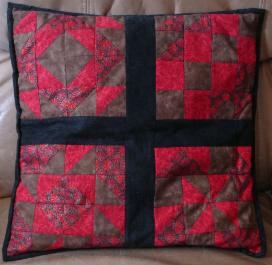 This was also the first one to be quilted on my new mid-arm machine instead of the regular sewing machine. 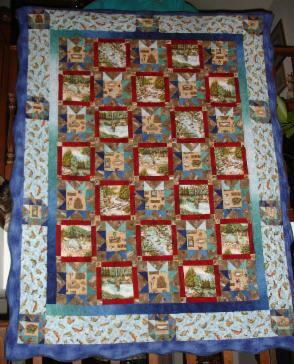 Apparently, unbeknown to me at the time, I quilted the pattern 'Asian Waters' which started narrow at the top and wider at the bottom and suits the quilt very well as the pattern is similar to the well known “Japanese Bark”. This quilt was originally inspired by our Guild's block of the month which my hubby saw me making and commented on how much he liked it. I found some gorgeous batiks in shades of Autumn. I made it to fit our dining table using cut out corners so that the edges would hang down straight at each corner. The internal corners on the binding turned out to be an interesting challenge which I eventually figured out and, in the end, they worked out well. 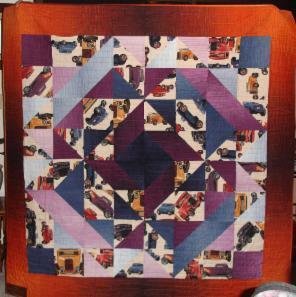 This quilt was made for my Dad on his birthday who enjoys tinkering with old cars. The print fabric has vintage/classic cars, some of which were fussy cut, and I managed to find matching colors in the variegated companion fabric. The pattern is known as Carpenter’s Star which is rather appropriate as my Dad apprenticed as a Carpenter in his youth. 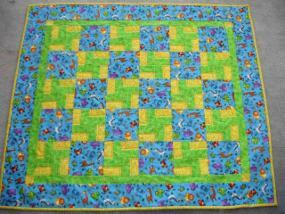 This quilt was for my wonderful youngest nephew to celebrate his 18th birthday. He loves mountain biking and does some amazing stunts. The bikers have the bright red, green and blue jackets and so made it easy to pick out the perfect complimentary colors. Again this was the Carpenter’s Star pattern but the color variation makes it look quite different to the 'Carpenter's Car' made for my Dad. 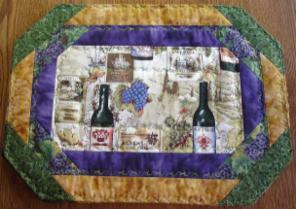 This quilt was a collaborative effort by several quilting buddies of mine. We all started with an 18" block and then bagged it up and sent it to the next person and let them do the next border. Four borders later you have a whole quilt. Traditionally known as a Round Robin we decided to call them Circular Seagulls! 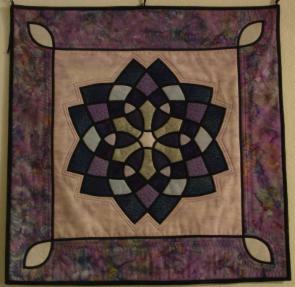 This one hangs on my quilt room wall and fondly reminds me of my quilting buddies. Thanks to Jenny, Joanne, Mary and Betty for each of their borders. This one was made for my cousin and her hubby when they visited in February 2008. They chose the playing cards fabric in the tiny print, plus I had another piece in my stash in a bigger print which I used for variation in the corner blocks. I picked out the red and blue from the tiny print, using both textured and printed complimentary fabrics to enhance those colors. The quilt then needed a focus and I hit upon the idea of the four card symbols. I looked them up on MS Word ClipArt...broke the image into its component parts and then made them fit a whole page size and used them as templates for satin stitched appliqué. The back was also a lot of fun...they chose an American flags print (as a reminder of their visit) and another fabric with a giant crossword puzzle. I made giant flags and then the crossword part I made up funny clues and filled in some of the sections with a fabric pen! The pattern for this quilt (59"x59") is now available to buy for $10! Contact me for a copy. I just love the gorgeous Christmas bauble fabric on these mats! 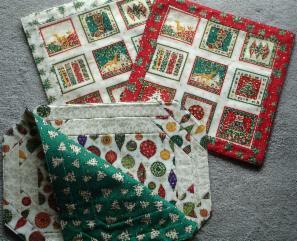 The back has Christmas trees on a green background which matches the fabric in red and white used on the back of the napkins. This companion fabric panel just lent itself so well to being on a napkin with a repeat after every 3 lines. I had to adjust the size of the napkin pattern to fit the panel, and the result was well worth it. After the Circular Seagulls were revealed, many in the group asked for a demonstration of the Cathedral Window technique I had used in my centre block. 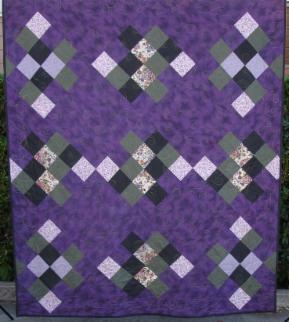 I initially made one block from batik fat quarters in one of my favorite color combinations of purple, green and contrasting cream. 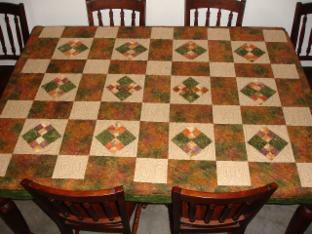 It looked so gorgeous that I used up the remaining fat quarter fabric which was just enough to make a table runner/centerpiece. This one was made for my Hubby as he loves fishing and I found these really cool fish fabrics. The star points I made from a gradated fabric, picking up a different shade for each point. The stars in the border were made from the cut off leftovers from making the larger main stars which helped to eke out the border fabric as I didn't purchase enough yardage. In fact, I think they added interest and variety to what would have otherwise been just a regular border, so I'm glad I didn't have enough border fabric! I was bored with straight edges at this point, so I made a template for wavy edges around the border for a change which worked well to add to the impression of a flowing river. I came across this wonderful wine fabric a long time ago and just had to make table mats from it...there are four different design combinations. I originally made a set for friends that got married in June and liked them so much that I made a set for ourselves too. June 2008. Here's a variation on the color scheme - I made two of each variation. June 2008. The third variation. June 2008. 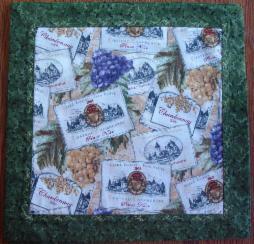 And finally here is the matching napkin that goes with the "Memories of Napa" table mats. I attended a class for this unique and fun technique at my local quilt shop! I used two fabrics in two color ways each; one fabric is dark and medium blue with snowflakes and reindeer and the other was white and pale blue with many different snowflakes. These fabrics lent themselves beautifully to the reversible nature of the design. 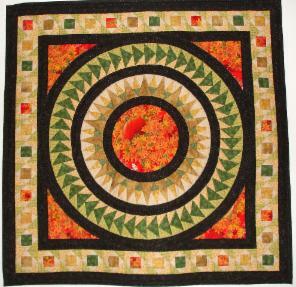 This is a close-up of the quilting design used in each circle. There were 36 blocks like this to do, so I devised a way to digitize the quilting template into my sewing machine software and used the embroidery unit to stitch them out! Really cool! This quilt was made on commission and based on the Dutch artist Mondrian's 'Composition A'. Initially, I thought "squares & rectangles; how hard can that be!" but then I found that there were very exact proportions to be taken into consideration, however, after a little math I had it all worked out! Initially I wasn't keen on this design - a bit too 'modern art' - but the more I worked on it the more I grew to appreciate it, especially after applying 888" of home made bias binding between all the colors! It was quilted very minimalistically which was in keeping with the theme; even the positioning of the quilting had to be correctly calculated though. For further information, see Commission Gallery. 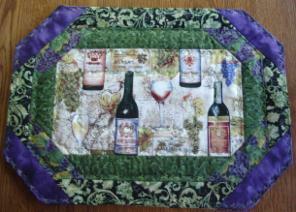 This was a collaborative effort with two other quilting buddies. 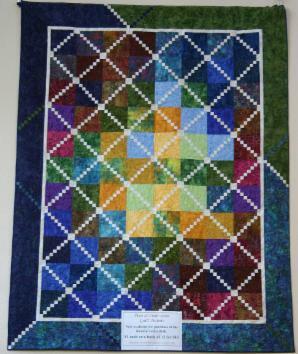 It was made for the local hospital as a Christmas fundraiser and raffled at an event called the Festival of Light. It raised over $2,000! There were 25 different beautiful batiks used in total, which almost gave the effect of a stained glass window. I quilted alternate scrolls and suns across each diamond shape to symbolize the light, and leaves along both sides of the borders. The borders were pieced with three of our favorite batiks from the 25 and was deliberately asymmetrical, continuing the theme of the pale pieces into the borders as transition elements between each of the colors. 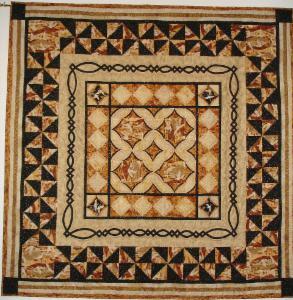 This design was shown to me as a small image from the web (1.5" x 1") and from that small image I created this commissioned quilt measuring approximately 100" square. 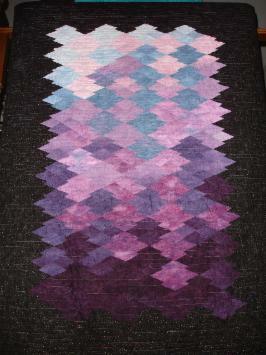 The centre circle on the finished quilt is 60" wide to give you a sense of scale. The templates for the fish and mountain pieces I drew by hand and the quilting stitches emphasised a different texture for each part; sky, mountain, moon etc. The fishes were quilted with scales and fins, and large scales were quilted into the blue background. The yellow and red motifs were satin stitched. 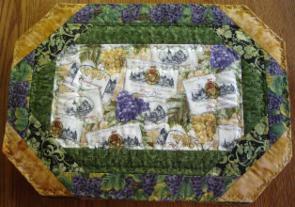 The fantastic fabrics that I found really worked well together and I was delighted with the result.